From 2nd July to 27th August, to celebrate their 45th birthday, Linn will give you 10% against new. To make this even more interesting, signals will contribute an additional 10%, making 20% allowance. Let the good times roll! This offer runs from 2nd July 2018 to the 27th August 2018 inclusive. Only orders placed during this period will be eligible for the promotion. 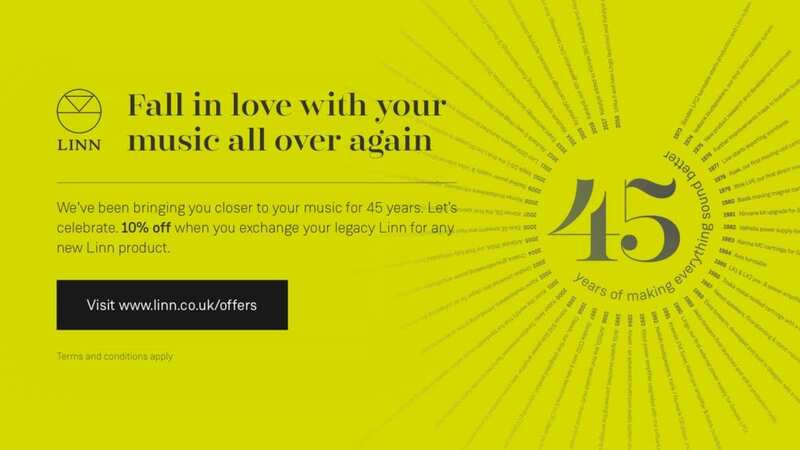 Under this offer, customers are entitled to a 10% reduction off the suggested retail price of products listed on the Linn Pricelist as below (exclusions apply – see below) when they trade in any of the Linn legacy products listed below in point 5. The Linn Pricelist is available on request from your Linn Specialist.